8 Days of Hanukkah Kosher Gift Basket by TastefulTreats.com at 365 Days Of Kindness. Hurry! Limited time offer. Offer valid only while supplies last. 8 DAYS OF HANUKKAH GIFT BASKET FEATURES A SWEET TREAT TO ENJOY EACH NIGHT. ALL KOSHER CERTIFIED PRODUCTS. FREE GROUND SHIPPING. Chocolate gelt, black and white cookies, an assortment of nuts, almonds, pistachio nuts and cashews. A candy tray with Jordan almonds, chocolate covered peanuts, chocolate raisins and chocolate non pareils. An assortment of dried fruits, Jelly Belly jelly beans, Godiva chocolate truffles, sweet rugelach, dreidels and of course, a stainless steel latke server. 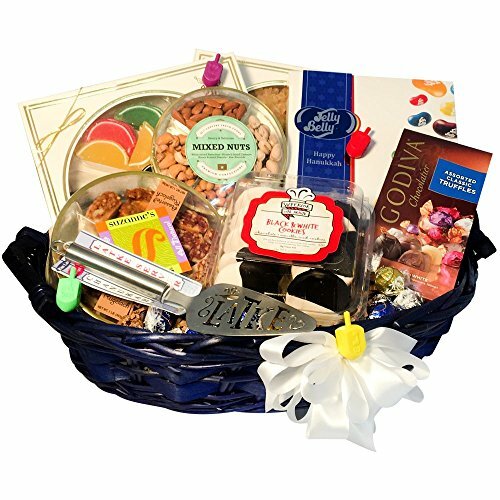 The perfect Hanukkah Gift Basket to send to family, friends and everyone who celebrates the miracle of Hanukkah.